The Russian army seems to be becoming a trendsetter of world military fashion. She has at her disposal not only weapons that no army of the world has, but also the best form of clothing. Great interest in it showed the largest army of the planet – the Chinese. At the request of the Chinese military leadership, the Russian Ministry of Defense handed over 17 sets of military uniforms to their Chinese colleagues. “MK” found out, why did the generals from Celestial so interested our military uniforms. The fact that China is interested in the experience of creating the Russian form of a new type, was told to our Minister of Defense Sergei Shoigu by Deputy Chairman of the Central Military Council of the PRC, Colonel-General Zhang Yusya during their meeting in Beijing on October 19 last year. The Chinese commander asked for samples of casual clothing for the generals, officers and soldiers of the Land Forces, the VKS and Navy. And on February 14, 2019, 17 sets of winter and summer military uniforms were handed over to representatives of the People’s Liberation Army of China. 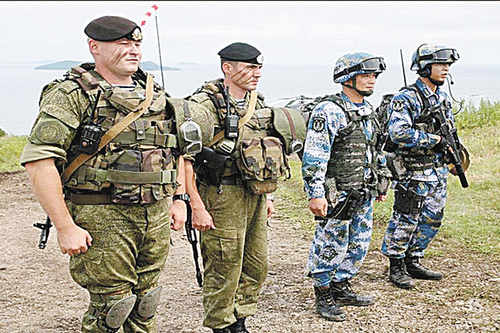 According to our military, the Chinese had the opportunity to observe how well the new uniform sits on the Russian military during joint maneuvers “Vostok-2018” last September, as well as at the annual International Army Games. During such meetings, there is always the opportunity to look at how the opponent is dressed and whether it is convenient for him to fight in this. On the specific features of the Russian uniform style “MK” told the research institute, engaged in the design and selection of materials for the new military clothing. – The main criterion in the development of the new sample form was one – it should be convenient, – said the institute specialist. – If the residence time of a civilian at work is limited by the Labor Code, then the military or civil servant does not have such concessions. Under federal law, they can be in the workplace around the clock, and if necessary, more. In this case, the problems have to be solved the most specific. In such conditions it is very important to have comfortable clothes in order not to be distracted from the main work. For example, the jacket of the Soviet style was sewn around the figure and had to sit on a person like a glove. Our new casual jacket has a loose fit that doesn’t restrain movement. According to the creators of the new military uniform, they had to study the experience of developing the uniform of many foreign armies. New casual clothing immediately received from the military unofficial name office. This form is an innovation; it simply did not exist in the Soviet army. “We now have two types of casual wear, with long and short sleeves,” a representative of the Ministry of Defense told MK. – In fact, it is all-season, it was created taking into account all our climatic zones and, thanks to the materials used, became universal for both the south and temperate climates. 67% of the fabric contains natural fibers, cotton. And used a special interweaving of fibers. As a result, breathability is increased – one of the most important qualities of a cotton-polyester fabric. The design of the clothes is simple and functional. On the jacket – two chest pockets with chest stripes. The shoulder straps are removable. The same is the sleeve insignia. Previously, they were sewn, now they are on a textile fastener – on the so-called stickies. A new everyday uniform is worn by all officers, including the Minister of Defense. It is enough for the head of department to put on a woolen jacket from above – and now he is ready to receive a foreign military delegation, which is very convenient. For other occasions there is a field and ceremonial forms. “Not only Chinese officers were interested in our uniform during joint maneuvers, but also soldiers from other countries,” the Ministry of Defense told “MK”. – Although the Chinese quickly catch the best, the most advanced and try to adopt it. We are pleased that it was our clothes that interested them. But it is possible that other armies will want to learn from us. We do not mind share.